I love chickpeas. I eat them pretty every imaginable way – roasted, boiled, pureed, stewed, raw, and baked. I put them in salad, stews, purees, and they can be the star of the dish (like in this Chickpea Salad with Sauteed Onions and Garlic) or a supporting player. For these Baked Chickpeas with Tahini Sauce, the chickpeas are definitely the main attraction. The recipe for these Baked Chickpeas with Tahini Sauce is from one of my all-time favorite blogs – Smitten Kitchen. She calls the recipe Baked Chickpeas with Pita Chips. 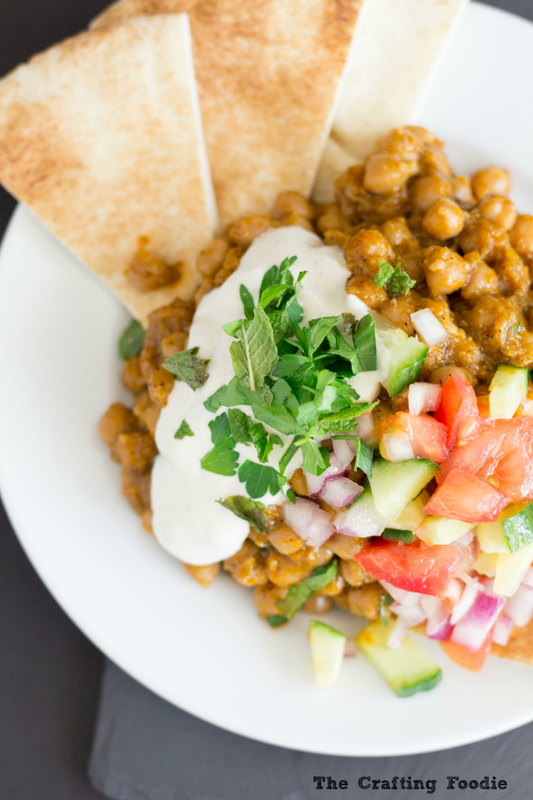 The reason I called my version of the recipe Baked Chickpeas with Tahini Sauce is because it’s the tahini sauce that brings a bright, fresh balance to these warm, hearty chickpeas. Without it, these baked chickpeas would be good. With the tahini it’s pretty darn amazing. 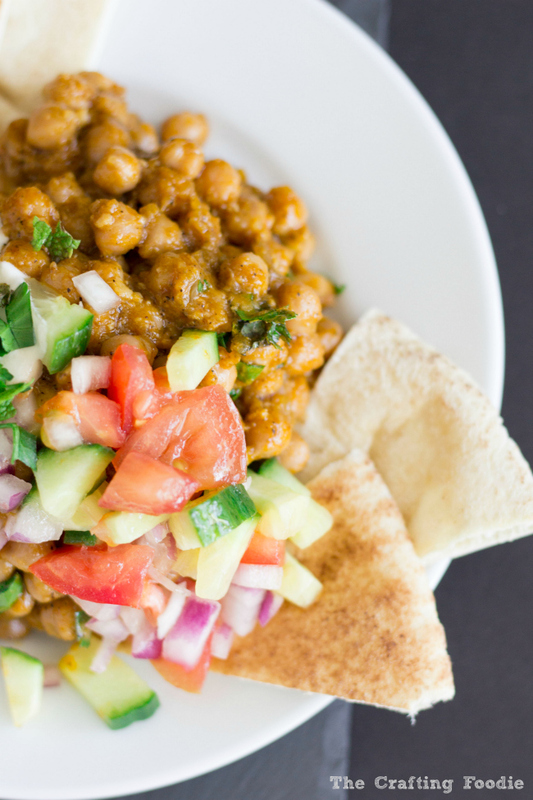 The chickpeas couldn’t be easier to make. They start with dried chickpeas, and while I love canned chickpeas, in this recipe, using dried chickpeas allows the flavors to penetrate the chickpeas. When I was talking to friends about my obsession with these Baked Chickpeas with Tahini Sauce, they both told me that they’d never cooked with dried chickpeas. I told them that it’s so easy. All you have to do is soak the dried chickpeas overnight, then proceed with the recipe. Cover the dried chickpeas with water in a large bowl. Soak for 24 to 12 hours. In a large stock pot or dutch oven, heat the oil over medium heat. Add the garlic and spices. Cook for about 3 minutes. Add the lemon zest and cook for an additional minute. Add the soaked and drained chickpeas. Stir to combine. Bring mixture to boil. Boil for one full minute. Add a lid to the pot, and carefully transfer the pot to the oven. Bake for about an hour to 75 minutes. The beans are done cooking when they are firm-tender. While the chickpeas bake, make the sauce and salad. Season with lemon juice, olive oil, and salt and pepper. Add the fresh chopped mint and parsley. Mix all of the ingredients together until a smooth sauce forms. Place the chickpeas on a plate. Dollop the tahini sauce over the chickpeas. Sprinkle with additional chopped mint and parsley. 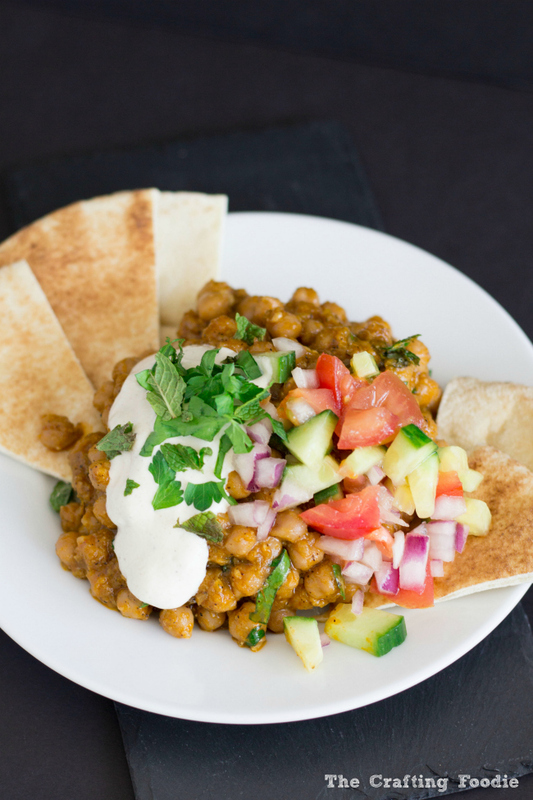 This recipe is only slightly adapted from Smitten Kitchen's Baked Chickpeas with Pita Chips. Wow!!! This looks so good and healthy! Yum! This looks amazing! I love that you served it with pita bread – my favorite! Thanks so much! My daughter ate all the components stuffed in a pita bread, and it was the perfect meal. I love anything that has to do with chick-peas and this dish looks delicious. I love how you are serving it with the cucumber salad. The perfect bit of freshness. I will be making this dish soon. Looks delicious! I love a great Greek/Mediterranean following. Thanks Maris! It tastes even better than it looks, and it’s so easy to make. It’s the perfect meal! Oh my gosh YUM! I’m so pinning this! Love that tahini sauce. I feel like I could dollop that goodness on EVERYTHING! I love Smitten Kitchen – it’s one of my go to sites for recipes. This one is making my mouth water, but I am sick in bed. Can’t wait to try it when all is well again. Thanks for sharing. Me too, Tara! I feel like pretty much everything she cooks is something I would love to eat 🙂 I hope you’re feeling better! This sounds fantastic! I love the flavors in this! Thanks, Leah! These are also some of my favorite flavors, and the chickpeas absorb every last spice. They’re really delicious! Lovvvvvvve Greek/Mediterranean food. 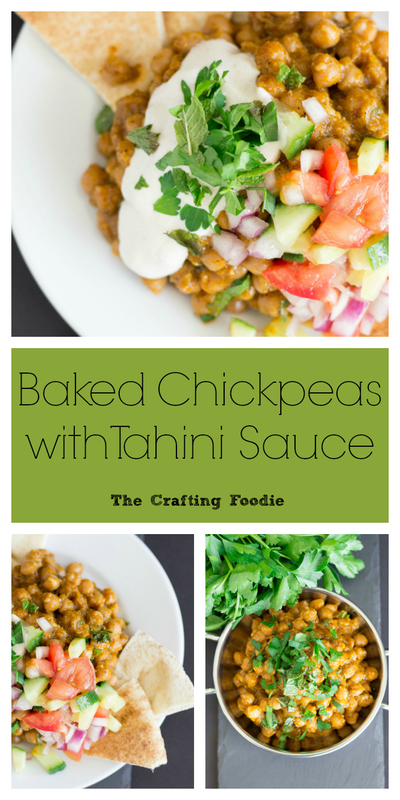 This looks perfect… from the chickpeas to the cool tahini sauce, to the fresh cucumber salad! Thanks, Rachel! My friends who are Middle Eastern say that this is a dish pretty much equivalent to what is culturally known as fatteh. And yup – the textures and flavors make it such a well-balanced dish. It’s so good! Mmmm looks amazing! Beautiful photos! Thanks so much, Bree! 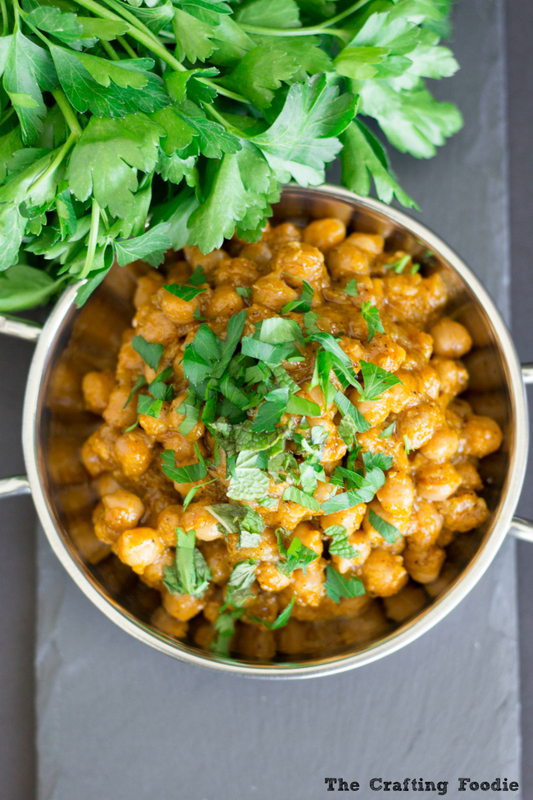 I love chickpeas too – they’re so versatile and healthy. Yum, that looks so tasty and will be a useful recipe to have as I try to eat more vegetarian. Oh my this looks so yummy! Can’t wait to try! What a beautiful dish and gorgeous photos!! <3 Scheduled to share and pin. I’m doing the happy dance over this dish, Aida! I LOVE Tahini sauce and this combo has got to be incredible. Can’t wait to try it and I see it as something that will go well with happy hour in the summer months on the back deck. Hope you’re doing well, friend. It’s been a good winter for running! Thanks so much, Robyn!! It is such a delicious meal, and yes, it’s the perfect munchable treat. It has been an amazing winter for running. It’s helped me keep my sanity 🙂 I hope you are doing well! This would really change up the old dinner routine! Can’t wait to try it. Thanks for linking up to What’s Cookin’ Wednesday!